Omega-3 fatty acids: Introduction; Fish oil sources; Microbial oils: Production, processing and markets for specialty long-chain omega-3 polyunsaturated fatty acids; Processing of marine oils; Concentrates; Enzymatic processing of omega-3 specialty oils; Applications in food products; Optimization of oxidative stability of omega-3 enriched foods; Analysis of oils and concentrates; The regulation of fish oils and omega-3 fatty acids in the European Union; Markets for fish oils and fish oil concentrates. 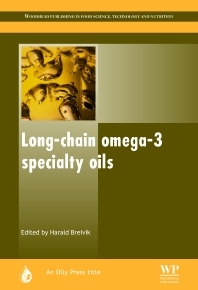 Unlike the many other books on omega-3 fatty acids, Long-Chain Omega-3 Specialty Oils is not concerned with nutrition but instead is aimed primarily at those people working to develop, manufacture and market long-chain omega-3 oils and the food, drink and pharmaceutical products containing them. It concentrates on the long-chain acids (C20 chain length and above), rather than alpha-linolenic acid. Although often thought of as 'fish oils', these omega-3 oils are also available from microbial fermentation and from other marine organisms such as krill. Furthermore, there is increasing interest in the development of higher plants with the ability to synthesise long-chain omega-3 fatty acids, with the ultimate objective of creating crop plants yielding oils containing EPA and DHA. Long-Chain Omega-3 Specialty Oils starts with an overview of omega-3 fatty acids, including a discussion of how they are formed in plants and animals, the physiological and medical effects of omega-3 acids, and the importance of chain length. This is followed by chapters discussing the wide variety of fish oil sources, as well as oils from fermentation of single-cell organisms. Separate chapters give information on state-of-the-art processing of fish oils, methods for making concentrates of omega-3 acids, and enzymatic processing and concentration strategies. The next two chapters cover the stabilization and utilization of omega-3 oils for various applications, followed by a chapter dealing with the challenging aspects of analysis of omega-3 acids and their decomposition products. The next chapter is dedicated to regulatory issues, and the final chapter gives an up-to-date survey of the various markets for long-chain omega-3 acids. Harald Breivik, Neperdo Biomarine, Norway.